To sign up for a new AWS account, follow the steps outlined in this tutorial. This will also automatically give you access to various services, including the Amazon Elastic Compute Cloud (EC2), Amazon Simple Storage Service (S3) and Elastic Block Store (EBS) services, needed for launching new servers with Bitnami Cloud Hosting. Visit the AWS account management page and log in if needed. 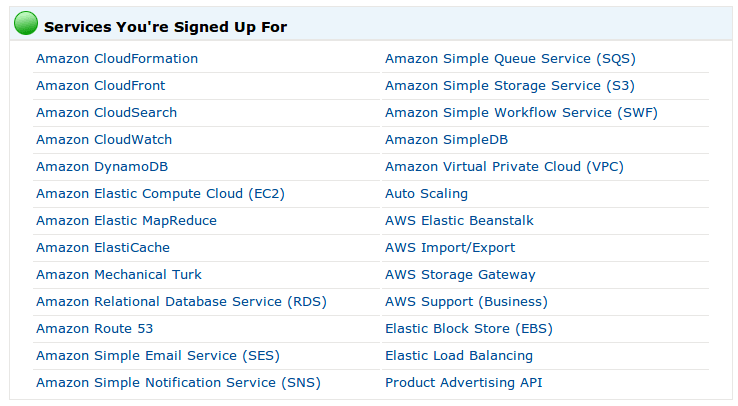 Confirm that “Amazon Elastic Compute Cloud (EC2)”, “Amazon Simple Storage Service (S3)” and “Elastic Block Store (EBS)” are listed as services you are signed up for. If these are not listed, click the “Add Now” button and follow the instructions to add these services to your account.